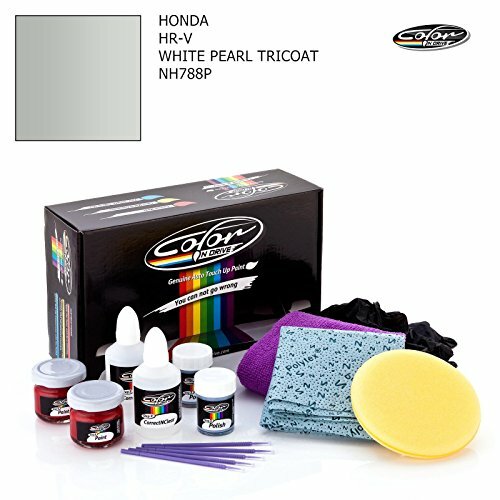 HONDA HR-V / WHITE PEARL TRICOAT - NH788P / COLOR N DRIVE TOUCH UP PAINT SYSTEM FOR PAINT CHIPS AND SCRATCHES / PLUS PACK by Honda at Beaver County Collision. MPN: C059298PLS. Hurry! Limited time offer. Offer valid only while supplies last. Say bye to your stone chips and scratches in your car. With German patented technology Color N Drive puts an end to your problem in 3 basic steps. Say bye to your stone chips and scratches in your car. With German patented technology Color N Drive puts an end to your problem in 3 basic steps. Evey kit is custom prepared in line with your manufacturer's choice on original paint brand. With innovative touch up paint system, Color N Drive easily treats the areas that needs to be covered fast and easy. Our system prevents your car from the affects of corrosion and rust. So you can get rid of expensive repairs easily. Due to the patented solution 'Correct N Clear', you can use the system without any worries. With only three basic steps you can repair paint chips and scratches instantly. If you do not know the color code of your car you can learn it from service manuals or labels in your car. Everything you need to repair paint chips and scratches are included in the delivery. Please note the scope of delivery may alter due to package choosen. There may be differences in the colors of the cloths and sponges.